We at Collector Circle are sure you are familiar with the term “Diversify your Investments”. People don’t usually think about “Art” as an investment. We hear about gold, stocks, bonds and real estate as an investment strategy. Collector Circle believes that art is a valuable global investment. Building an art collection is a unique form of investment in that it gives individuals pleasure and adds beauty and depth to their lives, while serving as a sound investment and an effective form of portfolio diversification. Today’s art market exceeds $30 billion in annual sales. Most transactions are executed by Galleries and Auctions. Art is considered an asset because works are owned, hold monetary value, and can be exchanged for such value. Because art objects are usually unique (except for additions), art is not a homogeneous commodity like stocks or bonds. Art prices are based on supply and demand. Marcia Eitelberg, President of Collector Circle, started out by collecting art because of a deep seeded passion. Along the way she found that it brought a great deal of investment potential. Her philosophy has always been; “someone bought a Picasso for $500.00 and so can you”. She started Collector Circle 11 years ago, in order to share her knowledge and perception to help others build great collections. From the beginning we have shown artists that have developed from emerging to established artists. Teaching our collectors to see and recognize stylistic tendencies while identifying their own preferences has been our goal. We can help you build a great collection while increasing your investment. We have several artists right now that fit this context. 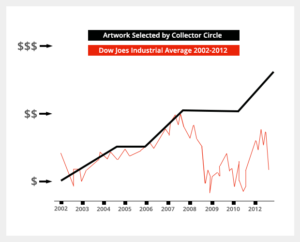 Keep in mind that when some of wall streets big firms went belly-up their art collections paid off much of their debt. Get in touch today to learn more about how you can begin building a collection while increasing your investment.